Asus has unveiled several new ZenBook and VivoBook laptop models at Computex 2018. As these aren't gaming laptops they all look very slim, slylish and businesslike, though the new VivoBook range can be quite colourful. Probably the standout product of the new mix is the ZenBook Pro 15 with ScreenPad Windows PTP (Precision Touch Pad). 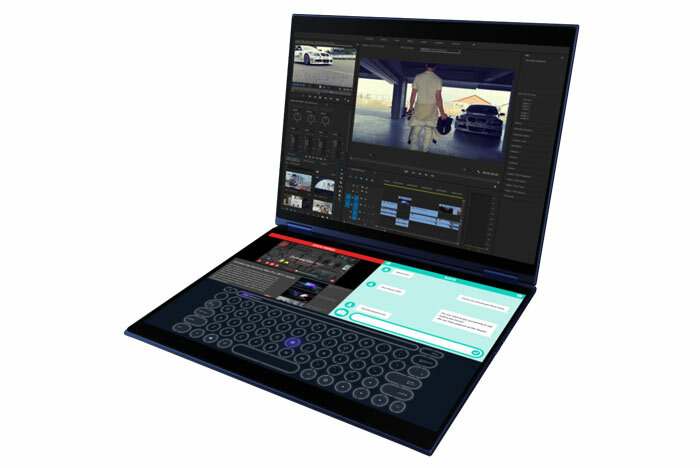 Another interesting information nugget concerned Project Precog, a dual-screen laptop with AI technologies adjusting the input display section. However that is, as it says, just a project for now. 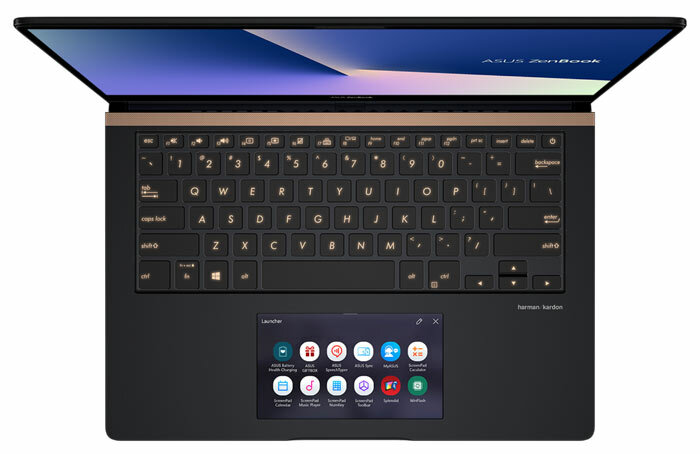 Asus has taken the slim and capable ZenBook Pro 15 and switched its integrated touchpad for a 5.5-inch FHD touch display. The display can easily cope with all the functionality expected of a Windows PTP but adds in a multitude of other ways - it can function as a launcher or second screen, for example. The system uses AI to intelligently adapt to what you’re doing, so hopefully its wide range of possible functionality doesn't trip you up. The Microsoft Windows Experience blog contains a useful rundown of how ScreenPad works in practice. Press F6 to toggle ScreenPad modes between touchpad and touchscreen modes or even use Screen Extender mode to use the ScreenPad as a second screen. It sounds like Microsoft has worked closely with Asus to make the ScreenPad more useful than outlined above, especially for Office users. When using Microsoft Word, Excel and PowerPoint the close integration with ScreenPad results in adaptive menus and editing controls appearing on ScreenPad automatically, according to the app and what task is being performed. The Asus ZenBook Pro 15 with ScreenPad will be available from July, worldwide. Pricing will start at $2,299. This laptop convertible leverages twin screens and advanced AI features and is evidence of Asus embracing the AI revolution to deliver compelling new user features. As a convertible Project Precog and be used in one of four modes; Stand, Book, Tent, and Flat - so far so humdrum. However, its full sized dual screens, eschewing the traditional keyboard and touchpad, really adds to its flexibility. Similar to how the ScreenPad in the Asus ZenBook Pro 15, discussed above, adapts intelligently to your task, Project Precog is said to automatically adjust its virtual interface. As it is a much bigger touch surface it is even more flexible; the virtual keyboard location can vary depending on where the user places their fingertips, or it automatically switch to stylus mode when a stylus touches the lower screen. Asus also sees the second screen as a more natural location for AI assistants like Cortana and Alexa. 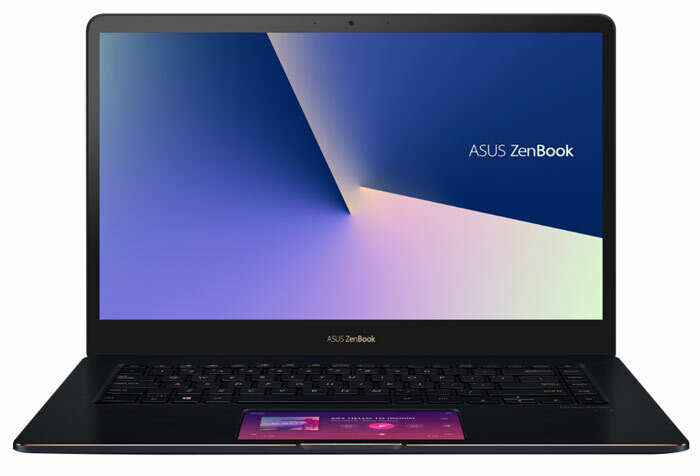 In addition to the above Asus has launched several more new and updated ZenBook and VivoBook designs. A smaller ZenBook Pro 14 (UX480) will launch later in 2018. I'm not sure if there will be a ScreenPad option for this SKU. The 13.3-inch ZenBook S majors on slim portability but is still sturdy enough to meet military-grade MIL-STD-810G durability standards. Lower down the pricing scales reside the Asus VivoBook products. The VivoBook S15 and S14 are a pair of lightweight laptops powered by up to 8th Gen Intel Core i7 CPUs and featuring all-day battery life, unique colour-blocking designs in five colour options, and three-sided NanoEdge display. They are dual-storage designs and some models come with Nvidia GeForce MX150 discrete graphics. These 15.6- and 14-inch laptops weigh in at just 1.8kg and 1.4kg respectively. Additionally the VivoBook S13 (S330) is the first ASUS laptop to feature a four-sided NanoEdge display with a remarkable 89 per cent screen-to-body ratio. If you are a fan of convertible form factors the new VivoBook Flip 14 (TP412) is just 17.6mm thick, weighs 1.5kg and sports up to an 8th Generation Intel Core i7 processor with 16GB of memory, and up to a 1TB SSD. that Screenpad is a sales dream. In a PC retailer, Dept Store etc. if that is shown that in a succesful demonstration by a talented and well trained sales person, that will sell bucketloads!